A lot of people played video games very quickly last week, raising $1.7 million for charity in the process. All of the speedruns at Summer Games Done Quick 2017 were entertaining, but if you don’t have time to catch up on them all, here were some of my favorites. Yes, I watched this entire eight-hour run. No, I do not regret anything. This is a solid eight hours of precise play, cool tricks, and great commentary—not to mention neat observations on Final Fantasy VII minutiae that you might not have known before. Super Panga World is a Kaizo-style ROM hack of Super Mario World that would be impossible for most normal people to beat. Fortunately, runner Dodechehedron is not a normal person. This is some truly incredible platforming, performed in less than half the estimated time because Dodechehedron is just that good. A little hard to watch if you get motion sickness, but this one’s quite fun. So many weird tricks. Longtime RPG speedrunner Puwexil gives us a master class in how to beat Chrono Trigger in just over three hours, thanks to tricks and glitches. Great commentary, great routing, great video game. 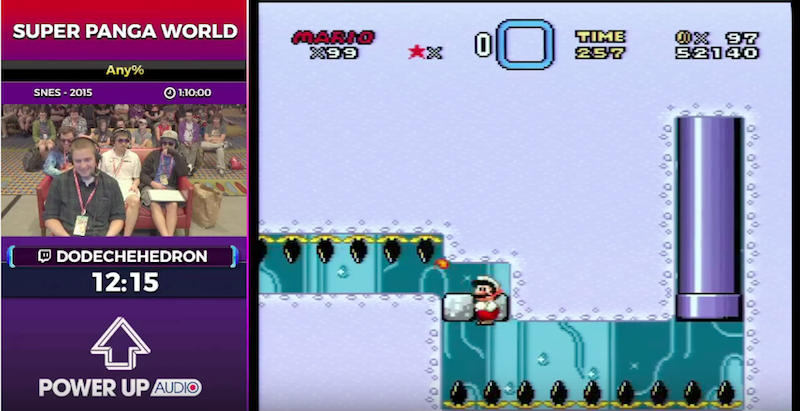 Watch three teams compete to beat five 2D Super Mario games in less than three hours. The precision it takes to knock through all of these platformers is impressive, and the runs are fantastic. It’s always fun to watch people break classic games, and Super Mario 64 is as breakable as it gets. Speedrunner Cheese05 has a mastery of this game like no other, snagging all 120 stars in the time it would take an average player to get, like, 10.
Who needs friends when you’ve got two hands? Speedrunner Azorae somehow performs this Portal 2 co-op run entirely by himself. Cave Johnson would be proud. Am I missing any really good ones? Drop your favorites in the comments and we’ll bump’em up.